More than $20,000 (£13,500) of computer equipment was stolen from the rapper's creative studio in Calabasas on Tuesday (24May16), TMZ.com reports. A door had been forced open overnight, and the thief had made off with laptop and desktop computers, law enforcement officers told the website. However, heavy technology security has prevented any information on them from being accessed or hacked into, and the stolen equipment has now been replaced. Police have no suspects as yet, but Kanye's team reportedly believe that the thief was someone with direct knowledge of what was in the rapper's studio. A representative for The Life of Pablo hitmaker has yet to comment on the report. 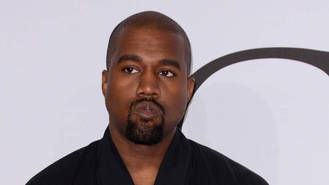 The news comes after reports suggest the rapper has threatened to sue the ex-police officer for going public with his thoughts and feelings after Kanye fired him ahead of the Met Gala in New York on 2 May (16). The 38-year-old hip hop star's lawyer allegedly sent a letter to the security professional Steve Stanulis demanding a public apology, noting he signed a confidentiality agreement as part of the terms of his employment with West. But the former cop has denied signing a non-disclosure contract, telling Page Six, “After I had finished working with them (Kanye and his wife Kim Kardashian), and my first comments came out in the press, Kanye’s head of security wanted to meet me and asked me to sign a post-dated confidentiality agreement, and I refused. "That would be like putting my head on the guillotine and pulling the lever." “Kanye is demanding an apology from me, but he owes me an apology for terrorising me," he adds. But sources close to Kanye insist Steve has forgotten he did sign a non-disclosure agreement back in February (16). According to TMZ, Kanye and his wife are planning to move forward with a lawsuit if Stanulis does not issue a formal apology for going public with his experiences as the rapper's minder.